If you’ve joined the electronic book revolution (or even if you haven’t), you’ll find that reading books on Kindle Fire is convenient and economical (e-books are typically a few dollars less than the print version, and you can borrow e-books from your local library for free). 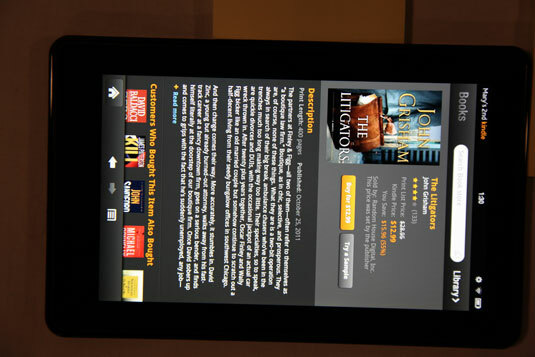 Tap the Books button on the Kindle Fire Home screen. The Amazon Bookstore sports a Recommended for You section at the top, recommending books based on your buying history. Swipe right to left to scroll horizontally through the recommendations at the top. You also see categories such as Top 100 Paid, Top 100 Free, and New & Noteworthy. As with the Newsstand, when you locate and tap an item in the bookstore, you see a screen with that item’s pricing and description. In the bookstore, the buttons you see at this point are labeled Try a Sample and Buy (or Buy for Free). Try A Sample: Tap this button, and it changes to a Downloading button, and then to a Read Sample Now button. Tap the Read Sample Now button to open the sample of the book. Buy or Buy for Free: Tap this button, and it changes to a Downloading button. When the download is complete, the button label changes to Read Now. Tap the Read Now button to open the book. Remember that the book is now stored in your Books library, where you can tap it to open and read it at your leisure. After you’ve read a bit of your new book, it will appear both in your Books library and on the Carousel on the Home screen. To remove a book from your device (remembering that it will still be stored in the Amazon Cloud), open your Book library, press and hold the book, and tap Remove from Device from the menu that appears.